Right at the end of 2007 the Observer ran a story that shames the whole classical music community, including this and other blogs. It was about the BBC's rejection of director Tony Palmer's Vaughan Williams film, a news story that was featured prominently by the Observer and several music blogs, including this one. It now appears that the rejection letter quoted in the coverage was a publicity-seeking hoax, although the identity of the hoaxer remains unclear - read the full account here. This story neatly sums up a year in which relevance became the order of the day, and swapping the long tail of culture for the short head of the mass market became the number one priority. 2007 saw Norman Lebrecht's attempts to go mass market hit the buffers, while William Barrinton-Coupe's efforts on behalf of his late wife met a similar fate. It was also the year when the Royal Opera House went mass market with its advertising, BBC TV went mass market with its classical music programming, Deutsche Grammophon went mass market with its CD covers, John Foulds went mass market with his World Requiem, the BBC Proms went mass market with its crooners, and the Simon Bolivar Youth Orchestra went mass market with its concert attire and politics. In 2008 On An Overgrown Path will stay focussed on the long tail, and now playing is Satori (1999) for solo harpsichord by John Palmer. 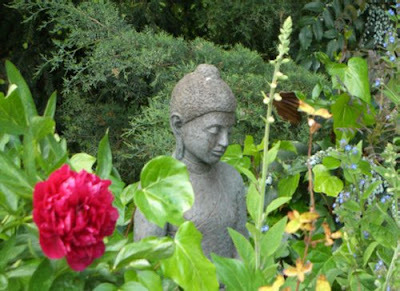 A long way from the Anglican rite, Satori describes the spiritual awakening during Zen meditation. This penetrating work, with its long silences is influenced both by the composer's friendship with John Cage and by his deep involvement with Japanese culture. Adventurous and thought-provoking new music from the enterprising Sargasso label, which revels in promoting the long tail. Check out good length MP3 samples here. The CD has excellent sleeve notes by Peter Burt, including this one for the title work - A koan, for instance, is that type of apparently nonsensical question by means of which students in the Rinzai school of Zen are trained to transcend the limitations of verbal reasoning, the most famous example perhaps being Hakuin's 'What is the sound of one hand clapping?' (My own mischievous answer has always been that it is the audience reaction at the average new music concert). Peter Burt neatly disposes of the long tail versus mass market conflict with these words - All this picturesque 'Japaneseness' might make it sound as though the listener to this CD is in for a comfortable session of 'New-age' easy listening. But be warned: someone who submits himself to the ascetic severities of Zen monastery life could hardly be expected to opt for facile and superficial artistic solutions, and the musical language of John Palmer's work is uncompromisingly Western and modernist. It demands of its listener, no less than of its creator, an attitude of disciplined seriousness. Deeply rewarding listening. Which eloquently sums up the long tail listening experience. * Celebrate the new year with some more long tail - my David Munrow on the record programme is being repeated on Future Radio by popular demand at 7.00pm on New Year's Day, click here for the audio stream. 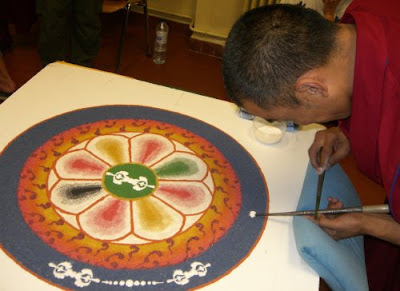 Sand mandala header photo from my 2007 post about the Free Tibet campaign. And no apologies to all those who think politics, music and sport don't mix. With the Olympics in Beijing in 2008 it is a subject I'll doubtless be returning to. Sand mandalas are a motif in Martin Scorsese's film Kundun which also deals with the Chinese occupation of Tibet, and I featured Philip Glass' score for the film on internet radio in November. 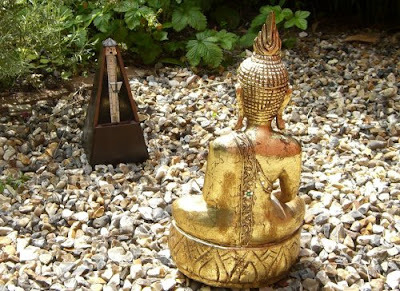 My middle photo is from Going Buddhist which featured the music of Lou Harrison, the footer image is from Zen and the art of new music about Jonathan Harvey's music, and there is another contemporary music Koan here from James Tenney. Lots of long tail links for the new year.